If anyone on your Christmas list is over the age of 13, then they probably want cash for the holidays. However, some don't like giving cash because it feels less thoughtful so consider a gift card to one of their favorite restaurants, or a new one to try! If you’re a gift card giver and are celebrating Christmas in Tampa, then check out our list of local restaurants in Tampa with the best holiday gift card deals. If you spend $50 on gift cards at Shells during the holiday season, then you'll get $10 off your next order. This voucher will come in handy next time you’re craving fresh and delicious seafood. Shells Seafood is a local favorite for over two decades, with locations in Tampa, Brandon, Carrollwood and St Pete! A great steak is better when you don’t have to pay for it! For every $50 worth of gift cards from Outback Steakhouse, you'll get a $10 coupon voucher for the next time you can’t get that bloomin’ onion out of your mind! Fun Fact: Did you know that the Outback Steakhouse restaurant chain was founded in Tampa? Tampa’s newest and most exciting Brazilian Steakhouse will be giving away $25 bonus cards when you buy $100 worth of holiday gift cards. If you’re looking to give someone a new dining experience, Terra Gaucha is the perfect place to send that friend or family member. 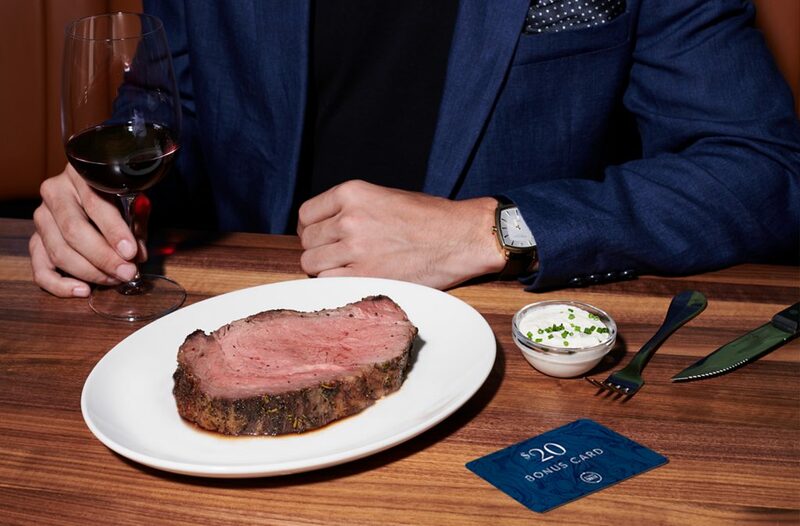 If you want to impress the foodie in your life, stop by Del Frisco’s Grille and spend $100 for a $20 bonus gift card. May I suggest the truffle mac and cheese and cheesesteak egg rolls? Delish. They've got an exceptional wine bar too. Your five-star dining experience awaits! Family style dining and a great menu filled with Italian pasta, entrees, dessert, meatballs, sauces and more, oh my! All the dishes are sure to make any Italian Nonna proud! Buy $100 worth of Maggiano’s holiday gift cards to get a free $20 gift card. Dulce! Opa! If your friends are always in the mood for tzatziki and gyros, spend $40 on a gift card, and Little Greek will add an extra $10 to your gift card! They're a perfect choice for delicious fresh and healthy dishes. They've got several locations all throughout Tampa Bay too! Attention, foodies: When you buy $100 worth of gift cards from Datz during the holiday season, they give you a $20 gift card for yourself! What’s better than giving gifts and getting gifts in return just for spending? Datz for Foodies! If someone on your list is a serial dater, Bartaco is likely a place that they frequent! With good vibes and cool decor, this is somewhere they could take all of their dates! For every $50 spent on gift cards, you get a $10 voucher for your next time at Bartaco! If someone on your list has a sweet tooth, head to Little Donut House for a free 3 pack of donuts with every purchase. And because they're going to be so good you need to return for round 2, grab a $25 gift card and get a FREE travelers mug or tumbler. If you’re purchasing a gift card for the picky eater on your list, check out Stonewood Grill & Tavern as their menu has something for everyone! From sandwiches and burgers to seafood entrees and salads, it’ll be easy to spend this holiday gift card! For every $50 you spend on gift cards, you get a $10 voucher. It’s all about the atmosphere at Bulla Gastrobar! With their rooftop terrace and quality Spanish cuisine, this is a gift card for those fancy folks on your Christmas list! When you buy $100 of gift cards, you're given a $20 gift card to use after January 1. Handmade pasta cooked to order for each dish? This South Tampa staple has been serving some of the best Italian food for decades. You'll love Bella's late night bar menu too. When you spend $100 on gift cards, Bella’s gives you a $20 voucher. For every $300 spent on gift cards, you also get a free Bella’s cookbook. You don't have to go to the beach to find great seafood specialties or shellfish. With two great locations, Pinchers in North Tampa and Wesley Chapel offers a great seafood dining experience for all of your suburb friends. When you buy $25 worth of holiday gift cards, you get $5 in bonus bucks for your next visit to Pinchers! O’Briens Irish Pub in Brandon is a Tampa favorite, serving great food, live music, and hosting some very fun events! Bucs and Bull fans and music lovers alike will love this most thoughtful gift card. Buy $25 worth of gift cards and you'll get $5 towards your next purchase starting January 1! Noble Crust in Wesley Chapel has all of your takes all of your preconceived notions of Italian food and enhances them! During the holidays if you pick up a gift card over $50, you get a $10 bonus card that is valid January 1st- February 11th. If you haven't tried Cru Cellars yet, you're missing out! With 2 locations, one in Palma Ceia and the other at Armature Works in Seminole Heights, Cru Cellars has blown my expectations out of the water both times I've eaten there. Right now when you purchase a gift card of $100 or more you are given a $20 wine bar gift card for free! For every $50 MOD gift card purchased, you will receive a coupon for a free MOD pizza or salad and a 16 oz. Coca-Cola. Pizza can be redeemed all month long in January. 'Tis the Season of Giving, Shaking and Stirring. Purchase $500+ in gift cards and receive a signature martini set along with an additional card worth 10% of your purchase. Tampa restaurants not only serve up some of the best food but have the sweetest deals on holiday gift cards this Christmas in Tampa. Eat, play and love local supporting local businesses in Tampa. Register on 813area, your free local guide to the city and never miss out on things to do in Tampa!